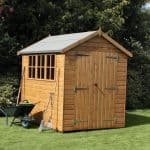 At such an affordable price, the 8 X 6 Reverse Apex Overlap Wooden Shed really is a very attractive garden shed. It has a very classic look to it and the rough cut of the wood really does give it a lot of personality. The reverse nature of the shed really does make it very appealing. Right next to the single door is a polycarbonate window that will ensure that there is always a good amount of natural light in the shed. The design of the shed is so smart that it will fit in any style of garden. Also despite offering a decent amount of storage room, this shed does not actually take up a whole lot of space. The overlap cladding used to make this shed may not be the thickest we have seen, but it is still going to stand up to the rain and snow and not allow anything inside the shed. The frame that the cladding is connected to is thick and robust so the shed will have a very strong and sturdy feel to it. For such an affordable shed the door really is very high quality. It is finished off with hidden hinges for extra security and it also is made extra strong thanks to the double z framing on the back. 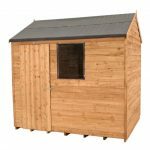 The 8 X 6 Reverse Apex Overlap Wooden Shed is a great budget priced 8 X 6 shed that is sure to tick the boxes for what many of you are looking for. To start with it has a very smart look to it. This has a classic shed design and we think that is very appealing. At 7 feet 8 inches wide and right under 7 feet for depth this is one of the better sized 8 x 6 sheds we have seen. We are sure you will be able to store many different tools, toys, bikes and other such items in here. At its highest point along the ridge the shed offers 7 feet 7 inches of headroom so moving around, working or just having five minutes peace will be comfortable inside here. We really like the apex roof that they have used on this shed. Due to the reverse design of the shed it does mean that the rain will run down the front, but as it looks so smart we are sure you will get over this. The roof is made with basic solid sheet boarding which some people may think is a little on the thin side, but to be honest with you this is the exact kind of roof we would expect on a shed of this size and price. Covering these boards is some very smart looking roofing felt which we feel finishes the roof off perfectly as well as protecting the boards from anything Mother Nature may decide to throw at it. 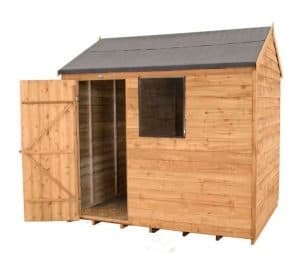 The cladding on The 8 X 6 Reverse Apex Overlap Wooden Shed has a great look. It is overlap cladding and they have given it a rather rough look, which we really like. The cladding is going to do a very good job at keeping the rain out, but at 7 mm thick it is a little thinner than we would have liked. They have not actually disclosed the size of frame that is inside this shed, but we have had our magnifying glasses out and can spot a 28 mm x 28 mm frame from a mile away. This is the standard kind of frame for a shed like this and it is certainly strong enough to make sure the shed stays strong for many years. While the cladding may be a little thin, we feel that the frame will ensure that this is a robust shed. Just like the roof, solid sheet boarding is used for the floor. This is not a huge surprise and it is a way for them to keep the price so low. A solid sheet boarding floor is not the strongest or prettiest flooring, but it gets the job done and for general storage it is more than up to the task. But if you do plan on putting some really heavy items in here, then have a think about reinforcing the floor with some extra bearers. There will be a basecoat treatment applied to The 8 X 6 Reverse Apex Overlap Wooden Shed so it will be fine during transit and installation, but that wood will need a coating of wood treatment shortly after installation. You will want to give the shed a new coating of wood treatment once a year. 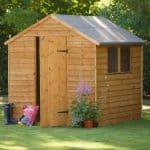 We know this sounds like a lot of work, but treating a shed like this will take no time at all. 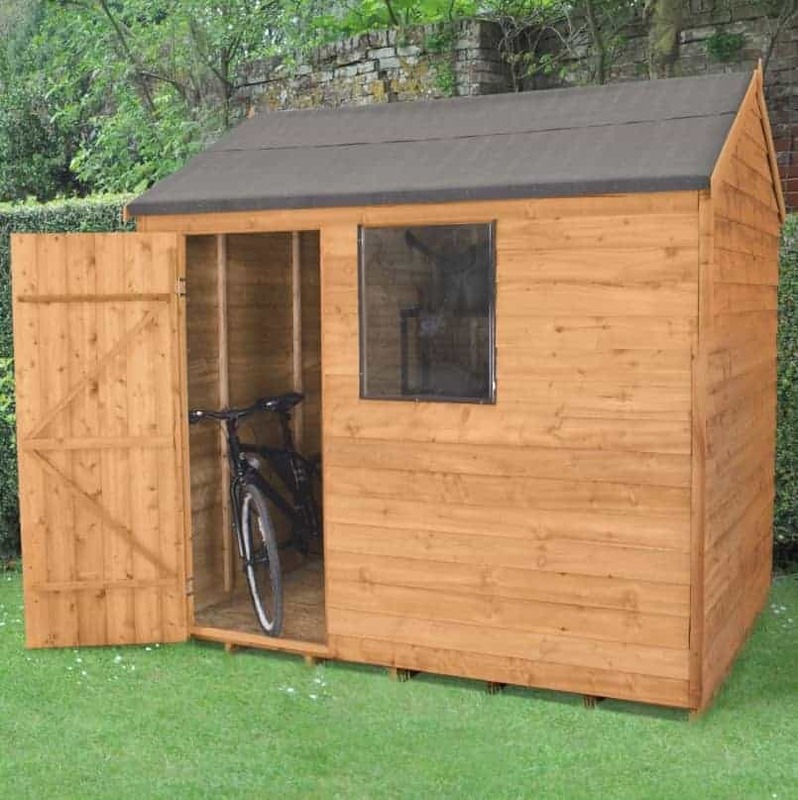 There is a ten year guarantee that comes with this shed and that is reasonable. 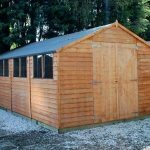 As is the case with most sheds that require treatment, the guarantee does require that you properly treat the shed in order for the guarantee to be valid. 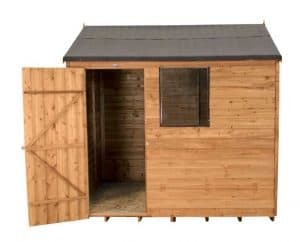 The 8 X 6 Reverse Apex Overlap Wooden Shed has a single door. This door is the standard size for a single door so you should be fine getting things in and out of the shed. The design of the door is very impressive. 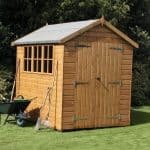 To start with they have used hidden hinges so when the door is closed it gives the shed a very smart and uniform look. The door is also very strong thanks to the double z framing on the back. Sometimes these cheaper sheds have doors that can become a little weak over time, but thanks to that strong framing we do not think this will be an issue. As this is a budget shed, we were actually quite surprised to see that this did actually have a window. A decent sized 1.5 mm polycarbonate window is located right next to the door. This is quite impressive for a shed at this price range. While it is a fixed window, we feel that it is going to let in a good amount of natural light. The 8 X 6 Reverse Apex Overlap Wooden Shed comes with a pad bolt. This of course does not allow the door to be locked, but it does mean that you will be able to add a padlock to the door very easily and for very little money. You may think that you will not bother, but we would actually recommend you purchase a padlock, especially if you have some rather expensive items in the shed. The window is located on the front of the shed, but we do not see that as a big deal. It does mean that your items will be on show, but due to the design of the shed if you were to place your more special items at the back such as your expensive tools, then they would actually be out of sight. So while there is a window, this is a more private shed than you would think. As the 8 X 6 Reverse Apex Overlap Wooden Shed requires treatment it is actually very easy to customise. There are all kinds of wood treatment so be sure to have a look at some of the more fun and exotic colours like your greens, reds and blues before you go for a standard brown or clear. Surprisingly they do not actually offer any extras with this shed at all. In a way this is a huge positive as it means you have more money in your pocket to buy stuff to fill up the shed with. We really like this shed and feel that they have done a great job with the budget they clearly had. They may have cut corners with the floor and roof boarding, but apart from that we are impressed with the overall quality. You will need to look after this shed, but as long as you do then there is no reason at all as to why you cannot enjoy it for many years. We are very happy with the floor space that this shed offers and love the way how anything you store at the very back will be hidden out of sight. This is a two person job, maybe three if you want someone on hand to get snacks and drinks. You are looking at 8 hours at the very most to install this. If you are even just moderately skilled at DIY, you will have this up and ready in no time at all. 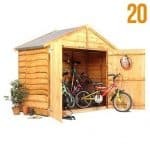 At just over £300, we feel that this is a shed which offers excellent value for money. 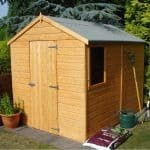 If you are on a budget, but still want a shed that has a good look and offers a decent amount of storage space, the 8 X 6 Reverse Apex Overlap Wooden Shed could be just what you are looking for. 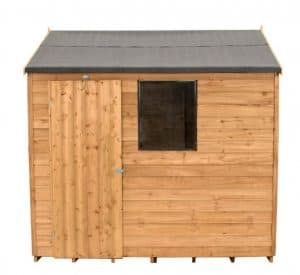 It is very easy to just focus on the roof and the floor and say these should be made with thicker wood, but at the end of the day as far as budget priced sheds go, this one is actually very good. The cladding may not be thick, but the design of it along with the framing still makes this a solid shed. In all, if you do not want to spend a lot of money then this is a shed you have to take a closer look at.